The nail Revolution has arrived. Nail trends come and go, but I have a feeling this one will be here to stay for a while. Because when you see what “the cool kids” are wearing nowadays, you’re going to want to join in. Eunkyung Park, is arguably the most famous nail artist in Korea, maybe even the world, and she’s responsible for starting some of the most sought-after nail art trends, including shattered glass nails, wire nails, and using negative space to create incredibly imaginative designs. It’s her latest creation, however, that has us truly mesmerized. 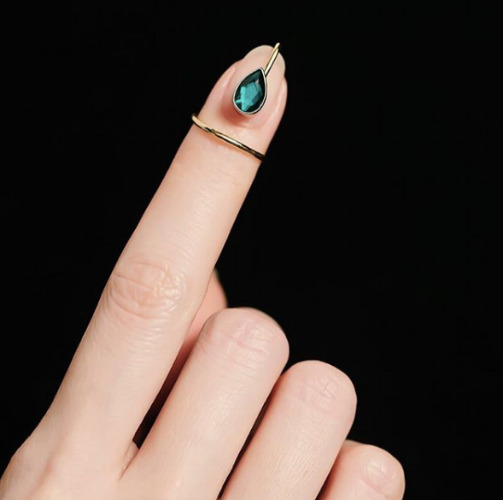 In June, the artist debuted a new project: nail jewelry — and people can’t seem to get their hands on it fast enough. If you follow Park, you know that she’s a fan of the minimalist style, and the gorgeous pieces in her new line definitely reflect that aesthetic, as well as the wire nail designs she made famous last year. Although she isn’t the first person to create nail jewelry or make “nail bling” popular, Park knew that she wanted her pieces to stand out from the rest. The first collection dropped at Barney’s The Drop, LA, with limited quantity and quickly sold out, unsurprisingly, as Park herself was there for custom fittings. “Since the rings are handmade, I’ve decided not to sell them online. I figured it would be a lot better for me to see your hands in person and make the best fit for you,” she wrote in anticipation of the event. Park, in humble disbelief, tells me that followers of hers traveled all the way from Hawaii to see her pop-up and get their hands on one of her limited-edition rings. The gold and silver rings were a hit — they completely sold out. Each of the rings has to be custom-fitted to your nail, so Park spent hours with her pliers, twisting and turning them to fit everyone perfectly. For this reason, Park is not selling the jewelry widely just yet. There’s still hope for those of us who missed out on this incredible Instagram opportunity: Park is currently in the process of trademarking her jewelry and plans to release a more universal collection for online purchase this fall. In the meantime, we’ll be working on getting our nails ready for the next big thing: Nail Jewelry by Park Eunkyung. What exactly is Le Musée de la Main?